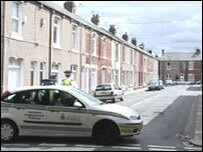 A Hartlepool man is facing jail after he urinated on a disabled woman who lay dying in the street. The 27-year-old shouted "this is YouTube material" as he degraded Christine Lakinski, 50, who had fallen ill, magistrates heard. Miss Lakinski, who suffered a number of medical conditions, died from natural causes, an inquest found. Anthony Anderson, of Raby Road, who admitted outraging public decency, will be sentenced at Teesside Crown Court. Hartlepool magistrates heard how, on 27 July, Miss Lakinski was making her way home with a box of laminate flooring when she fell ill and stumbled into a doorway. She was later declared dead at the scene, the cause of death being given as pancreatic failure. Lynne Dalton, prosecuting, said: "Although his actions did not contribute to her death it was appalling behaviour that robbed her of any dignity in the last hours of her life." She urged magistrates to transfer the case to crown court for sentencing, claiming their maximum powers were insufficient. Anderson's solicitor did not oppose the application and his client will be sentenced at Teesside Crown Court on 22 October. After Wednesday's hearing, Miss Lakinski's brother, Mark, said: "We will await the outcome and just hope he gets what he deserves."